First Lady Michelle Obama addresses the Democratic National Convention in Charlotte, N.C., on Tuesday. FIRST LADY MICHELLE Obama lovingly praised her husband Tuesday night in a prime-time Democratic Convention speech, describing him as a devoted spouse and caring father at home and a “man we can trust” to revive the nation’s weak economy as president. She beckoned the country to return him to the White House despite the agonisingly slow recovery from recession. “He reminds me that we are playing a long game here … and that change is hard, and change is slow and it never happens all at once,” she told a nation impatient with slow economic progress and persistently high unemployment of 8.3 per cent. “But eventually, we get there, we always do,” she told Democrats packed into their convention arena. Obama, given a huge ovation and emotionally describing herself as the “mom in chief,” made no mention of Republican challenger Mitt Romney. 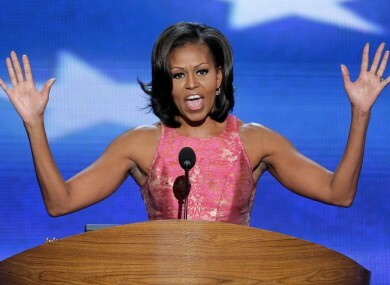 But those who preceded her to the podium on the first night of the president’s convention were scathing. “If Mitt was Santa Claus, he’d fire the reindeer and outsource the elves,” declared former Ohio Governor Ted Strickland in one biting speech. “He said he’d take out bin Laden, and with our great SEAL team, he did,” declared former Virginia Governor Tim Kaine in one of several references to the military raid that ended the life of the terrorist mastermind behind the attacks of 11 Septempter 2001. The president was back home in the White House after a campaign appearance in Virginia as delegates cheered every mention of his name from the convention podium. He and their daughters watched on television as Obama spoke. She confided that at family dinners in the White House with her and their daughters, the president joins in “strategising about middle school friendships”. “When it comes to rebuilding our economy, Barack is thinking about folks like my dad – who worked at a municipal water plant – and his own grandmother, a bank secretary,” the first lady said. He declared that 4.5 million jobs have been created since the president took office – though that number refers only to private sector employment gains over the past 29 months and leaves out state and local government jobs that continue to disappear each month. Castro, the first Hispanic chosen to deliver a keynote address, was introduced – to the delight of the crowd – by his identical twin brother, Joaquin, a candidate for Congress. The mayor was unsparing in criticising Romney, suggesting the former Massachusetts governor might not even be the driving force on the Republican ticket this fall. “Either way, their theory has been tested. It failed. …Mitt Romney just doesn’t get it,” Castro said. Romney’s running mate is Wisconsin Representative Paul Ryan. Romney and the Republicans favor extension of all of the existing Bush-era tax cuts due to expire on 31 December, and also want to cut tax rates 20 per cent across the board. Obama, too, wants to keep the existing tax cuts in place – except for people with earnings of $250,000 a year or more. Democrats criticised Romney last week for failing to offer a detailed plan to fix the economy. But nowhere in their own convention’s first evening of speechmaking did anyone present proposals for reining in deficits that now exceed $1 trillion annually. Delegates in the convention hall cheered whenever Obama’s image showed on the huge screen behind the speaker’s podium, and roared when the late Senator Edward M. Kennedy was shown mocking Romney in their 1994 Senate race. “On the issue of choice, I am pro-choice, my opponent is multiple choice,” the late senator said as cheers grew louder. Romney supported abortion rights while serving as governor; he opposes them now. Democrats unspooled insult after insult as they took their turn the week after the Republicans had their convention in Tampa, Florida. In his campaign trip to Virginia earlier in the day, Obama told an audience at Norfolk State University that the economy will get worse if Romney wins the White House this fall and that Election Day apathy was his enemy – and theirs. There was no shortage of political calculation behind the program of the convention’s first night – or for any other. Email “He's her man: First Lady praises husband Barack Obama during prime-time speech”. Feedback on “He's her man: First Lady praises husband Barack Obama during prime-time speech”.